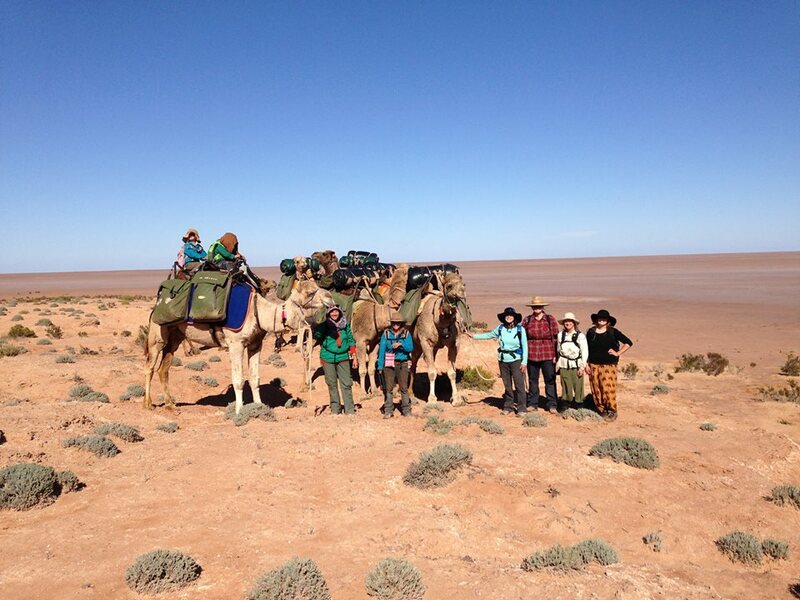 The 2014 Charity Camel Trek was much more than a ‘Camel Trek’ as most anticipated. Since the idea came to me back in August 2013 the demands of the inspiration to commit all efforts - no matter what - to making this CCT a roaring success for the girls who we were about to help and for the women part of the CCT team. Everyday this trek had been on my mind since the initial idea - which really was like a wave of inspiration came over me, nothing pre-planned, just a series of inspiration and then the thought “I CANNOT sit here and do nothing” which was the lead up to making the decision to do this trek and then committing to make it possible. I didn’t know HOW I was going to get (at that time) 8 ladies inspired to join me on this weird and wonderful adventure AND raise their amount to contribute to our $10,000 goal. I have been so inspired by the 5 women that did join me (even after a few setbacks of some drop offs), they kept things going strong and we went $3,580 beyond our goal and walked arpox 100km in 7 days. The inspirational words of Richard Branson stuck in my mind like glue “If someone offers you an amazing opportunity and you’re not sure you can do it - say yes, then learn how to do it later”. So that I did! The trek itself was intense and challenging for all involved. Migraines, Diarrhoea, back problems, sore feet were the physical aspects that challenged us all, not to mention the physical exhaustion and mental capabilities that we HAD to reply on to keep us going as our bodies began to decline the idea of going further. It’s truly amazing how the mind can control the body. In hindsight if we weren’t all so determined and committed we would have called for pick up on day two after our hot and hard 16km walk through the desert - that night everyone was in bed almost before dark! The camels found it all a breeze! This is easy work for them, even though some complained. These beautiful beasts certainly added “magic” to this trek as wonderful desert trekking companions with a delightful calm and peace about them as the casually walk across the desert carrying all our gear and supplies. I had a real moment with all 8 camels by myself while they were feeding out… I stood in a huge space of area with the camels spread out comfortable munching away on their bush tucker, I thought to myself “This is as good as life gets! ….. BUT on the other side of the world some children are feeling worthless, unloved and abused…. battered inside and out…. without knowing if they will ever get back to their own family….” This struck me hard, and I began to cry, because right in that moment I had it so damn good, but someone else didn’t and in particular a CHILD! This made me concrete my idea to do an annual event each year to put large sums of money to organisations such as Empower and International Justice Mission so that they CAN continue their good work. As trek member Keran says “We have two arms, 2 legs and a heart beat, of course we can help! My own family of 4 joined me on this Charity Camel Trek. My partner Russell (who i couldn’t have done this without him), Charlotte (5), Tate (4) & Owyn (13 months) were all involved in this trek. The children were absolutely AMAZING… Getting on their riding camel “Syhid" (expect Owyn, he was riding on our backs), day in and day out doing the kilometres that we needed to do. They truly blew my mind with their capabilities! Especially our Autistic son Tate, who we were most worried about “coping”. They took this all in their stride in a remarkable and admirable way. On the final night of the CCT all team members spoke of how the children inspired them to “keep going” as they were such troopers. We walked from base camp through Mt James, to [salt] Lake Torrens, around mount James, then towards Mt Deception: sand dunes, valleys, rocky plains…. The land ‘out there’ is incredibly diverse and changes serval times throughout the day. The generous Happy Camper Gourmet Camp Foods nourished us by night and East Gippsland Eats (Muesli) nourished us by morning, these were our major sponsors as were Beltana Station, Girl Director (Film/video company) and Outback Australia Camels. I encourage you to support these business that generously support this trek. I believe it’s important to make a statement about those that helped along the way and support them back. So much gratitude to all the people who supported this trek finically by generously giving to this cause, attending the fund-raising events and believing in the CCT team, we are all so grateful beyond words! Before the actual physical trek has stared I began thinking about the next - yes, my mind never stops! Their will be a 2015 Charity Camel Trek, raising money for a new project yet to be revealed. 2016 CCT will be more challenging, more kilometres, more $$ raised and only for experienced trekkers or those willing to train hard to be part of the team. Applications are open over at the website www.CharityCamelTrek.com along with short video’s of some our days out in the desert trekking. The journal book that will combine all team members journalling throughout the lead up to the trek and while on trek will be edited and complied into one inspirational book to be sold in Empower store(s) as an ongoing fundraiser and support, so keep your eyes peeled!